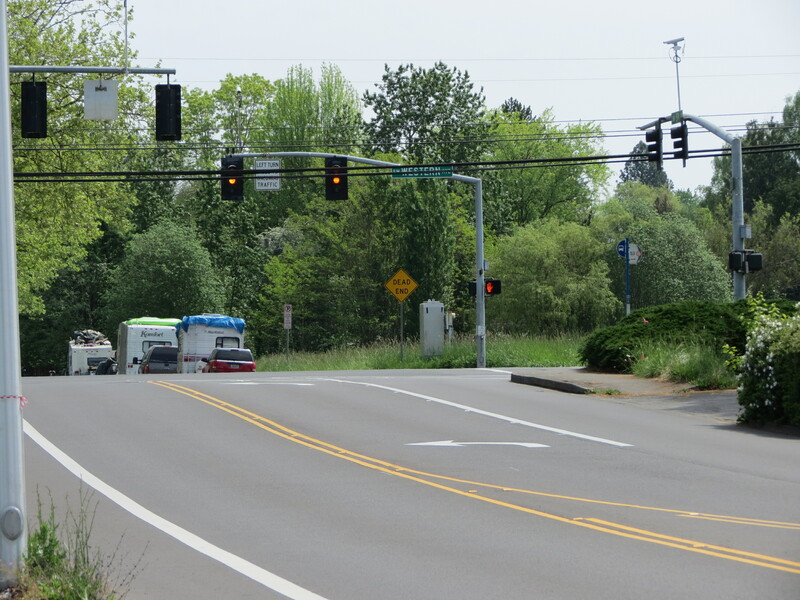 In my last post I pondered ideological implications of a Beaverton ban on overnight car camping. Since the council vote on that ordinance is TBD after the public hearing, there’s time to explore further, look deeper. My “field report,” a series of street scene photos, starts about halfway down, but as I was arranging the photos, a point of synchronicity occurred to me. 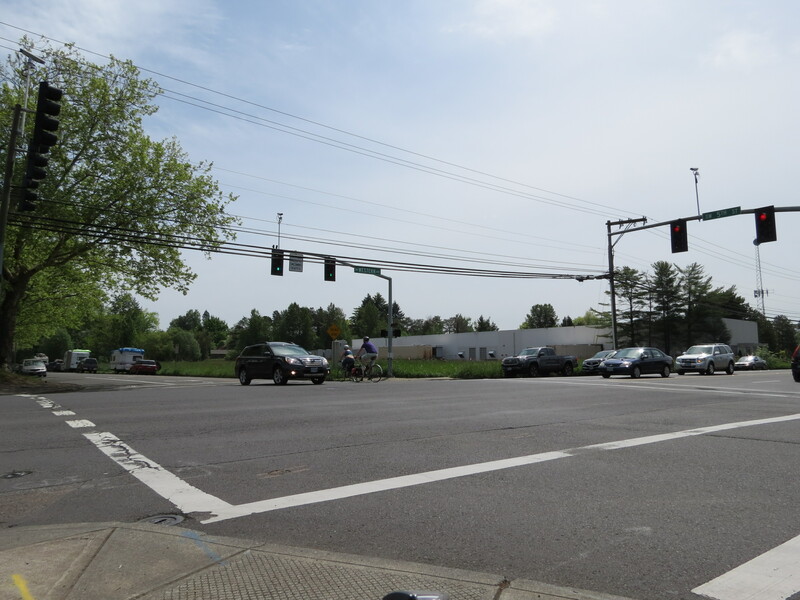 Another thing discussed at that May 1st meeting is the incorporation of Beaverton’s new Active Transportation Plan into the city’s development. This will free & empower more people to use vehicles other than cars for transportation. That’s great news! Some people can’t drive cars for medical or financial reasons, but are able to bike, walk or wheel to the bus. Bicycles are affordable & can help keep food on the table, because driving to work is not an option for everybody. And, if more people feel safe to start biking, the new policy could lead to smarter land use, with more homes & gathering places that people can afford. That preserves our environment & acts on climate. The new policy deserves attention & support. Unfortunately, local TV news can’t be counted on to help shift paradigms away from reliance on automobiles, which are advertised throughout their shows. A “ban” is like going to a surgeon about a symptom that’s emerging after years of imbalance. Alternatively, naturopaths would note the symptom, but take a holistic approach to restore balance, supporting the body as it heals itself. It takes time, but is gentler. Seen through a transportation lens, which is clearest after using something other than a car as transportation, “car culture” is a strong root of our housing crisis. The complexities & illogic of the automobile are beginning to be unraveled and solved here in Beaverton (not a second too soon). 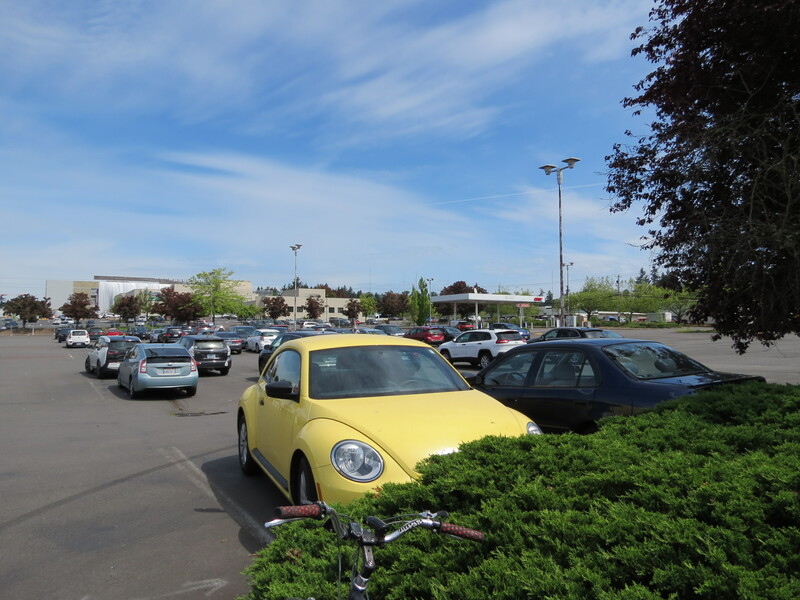 As more people move here, we have to ask: is it wise to use valuable space for all these cars? To loosen our UGB belt to fit enlarged pickups & SUVs? But the KGW report failed to mention, much less promote, that on the agenda after the camping ban hearing was a work session on Transportation System Investments. That session highlighted evolving paradigms of city planning that, in part, begin to address suburban symptoms of our decades of transportation system mistakes, many of which were predicated on racism & prejudice. Those mistakes, and the isolation, waste, & anxiety they cause, are captured in literature, film, and music. We have Eric Bogosian’s 1994 play SubUrbia, adapted for film in 1996 by Richard Linklater, not to be confused with Penelope Spheeris’ Suburbia (1984). We have movies like Duel (1971) and one I’ve avoided seeing, The Hitcher (1986). Even punk rock can be heard as an outgrowth of culture built around cars. (Sample Fast Cars.) Lately I find myself reading & viewing film through transportation symbolism & critique as much or more than psychoanalytic, reader-response, or formalism; I, too, listen to popular music in the vein of this Rush song analysis. Then there’s DeVaughn’s, “Be Thankful For What You Got” (1974), a song I love. And I am thankful for what I’ve got. Sure, I’d like a bike lane to go everywhere I go. But I’m thankful for leaders who are noticing the footprints of automobiles; & that roads & parking take up more land than is wise or affordable; that distances cars “conveniently” allow us to travel are too far for many families to maintain a job-life balance; & that smaller vehicles, coupled with transit, are safer, less polluting, healthier, happier… Can I get an Amen? Roads Connect Us & Make Us ‘We’ But Can ‘We All’ Use Them Equally? 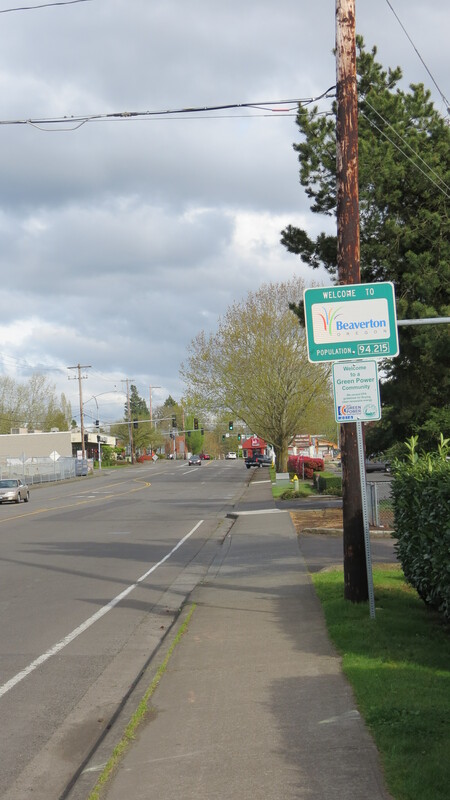 For years, Beaverton—and all American cities & suburbs—built & lauded what now amounts to car dependency instead of a medley of transportation choice, with transit & active modes. There’s sprawl, rather than close-in living everywhere. There aren’t enough public communal spaces and emergency weather shelters. We’re seeing & living with the results of avoidance. We’ve got to turn it around, rezone. But on “the news,” businesses in NW Fencing’s situation are still portrayed as having done no wrong, while the people outside are portrayed as “the problem.” It’s a “good guy, scapegoat guy” kind of story. 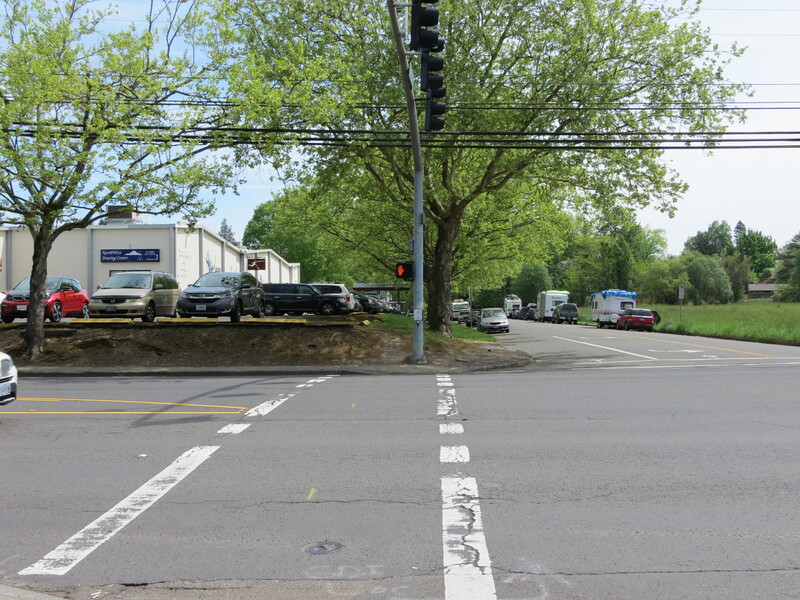 Not that they’re the only ones who don’t “see” roads, but NW Fencing Center doesn’t appear to fault, or even notice, all the car infrastructure to and around it. In the interview, there’s no mention—by businessman or reporter—that fast, wide Western Ave is also literally 50 feet from the door. That street is dangerous to fencing students biking, walking and crossing. Less land-intensive travel modes can’t thrive around roads like that. If safety for people, including kids and our elders, is important, this business should be asking the city to add buses and bike lanes on Western Ave—and everywhere—and rezone the giant gulps of valuable land currently spread with asphalt. KGW did not report that this business made any such requests. To the business’s credit, it does have bike parking; note the blue staple racks near the door in the video clip. But getting there is still tough. People who use bicycles in places like Western Ave are being threatened: by unsafe drivers, unsafe speed limits, lack of bike lanes, & so on. The last bone I’ll pick with news reports I’ve seen about car camping on city streets is, they’re not “balanced” with their (likewise voyeuristic) reports on domestic fights, guns pulled, & drug use all happening INSIDE cars, while they’re being driven, including by rich people who have homes, property & important jobs. Aside: I’m actually taking a year off from broadcast TV; in 2018 I’m relying on written reports and postings I find online. So, if any local TV news did in fact mention things like the City Council transportation work session, let me know in the comments. All But Some, Or All Or None? It’s hard to believe businesses on one hand ask the city to ban cars with someone inside, whose circumstances may be irrevocably tied to the imbalances of car culture… while on the other hand asking the city to devote even more public space to free car parking. Cars are private property. People aren’t required by law to choose to buy, maintain, insure, store, & use cars. Yet, cities have long allowed cars to be stored right on the public right of way. That prioritizes car travel by manufacturing risk and danger for people riding bicycles—including kids—with dooring & obstructed sightlines to & from driveways. People outside cars who are biking, walking to bus stops & using mobility aids like wheelchairs, need safe access to, on, & across the street. Our streets have become ubiquitous. Everywhere are fast, wide roads with land-hungry intersections. Crosswalks closed. Homes with giant, gaping doors. Walking & bicycles are “youth-based,” too. And, we have people riding bicycles for transportation who are ages 4 to 74. Make room for them, so they can make room for all. I went to see for myself, this “trouble spot” our local news has been highlighting. My first big surprise was to see that in contrast to the told danger—needles! fights! guns! arrests!—the people in campers had chosen an out-of-the way spot safely removed from the flow of traffic. Thus, they were not blocking visibility, nor creating a traffic hazard. 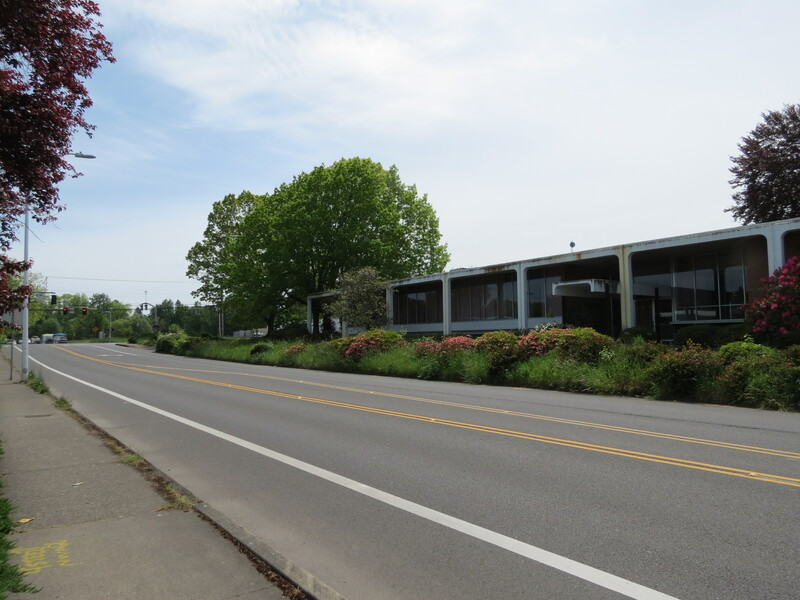 Instead, tucked away on a dead-end street (to cars that is—it’s a through street for people on foot & bicycle), next to a green, grassy field & across from sprawling asphalt parking lots and abandoned buildings, was the quiet row of parked cars & RVs. It seemed almost peaceful. Almost. But the abandoned buildings and lack of commerce lent a Grapes of Wrath vibe to the area… like an Ennio Morricone theme might start up at any moment, amidst a volley of tumbleweeds. Riding closer to the campers, the atmosphere felt quiet, if not boring. A woman sat outside her trailer, resting on the bars of the tow hooks, toeing the ground. Another woman, sweeping, moved around behind her camper. Yet another woman carried over a fresh gallon of bottled water. At this moment, the camp was decidedly female. A calico cat sat in the shade, licking its leg. Yards from the cat is this intersection—an expanse of asphalt—and in either direction, the street, along which it’s hard to imagine anyone finds it pleasant to walk. And, literally 50 feet from the door, is this huge intersection. I’d call that a safety concern. Next door to Northwest Fencing Center on the north side is a billiards hall and an auction house. 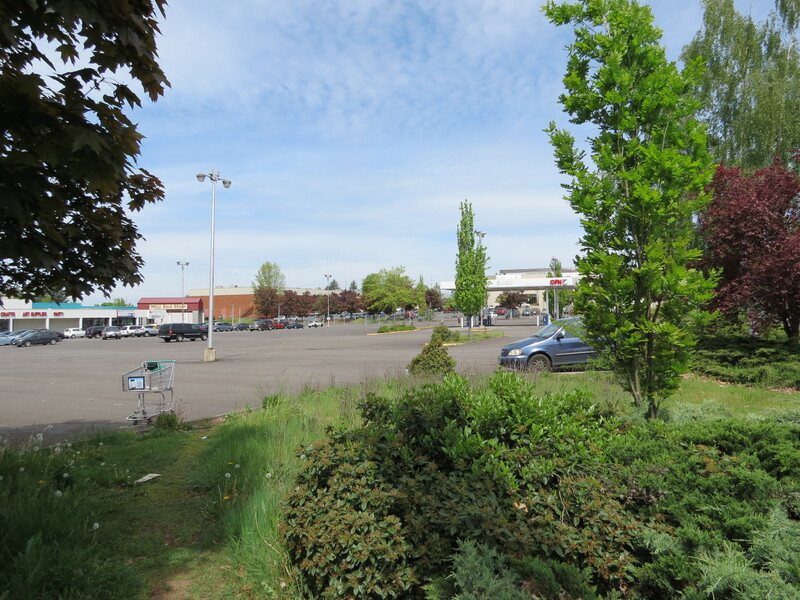 Vast swaths of land are dedicated to these businesses’ rows of car parking. 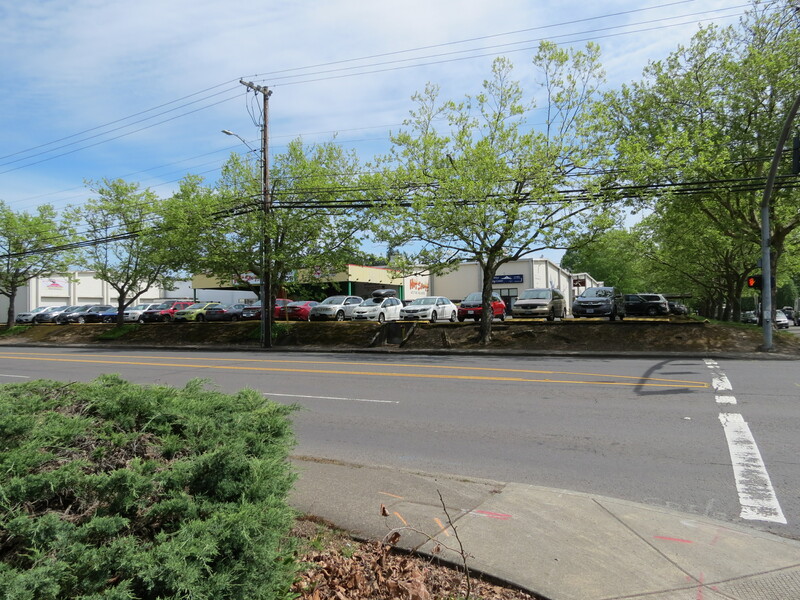 Approaching the fencing facility from the west, on 5th St, there’s a long line of on-street car parking. There’s more further west by a church across from the Beaverton Library. Coupled with disappearing bike lanes, on-street curb parking poses risks to children and their families using the bicycle lane. “I’ve called the police numerous times. I’ve been threatened,” said one frustrated neighbor in the KGW interview. “Move em! You know. Just, find where they can go.” He was not talking about the lines of empty cars parked along the street, but he could be. We need less space that’s intended for cars. Much less. And more space for people. 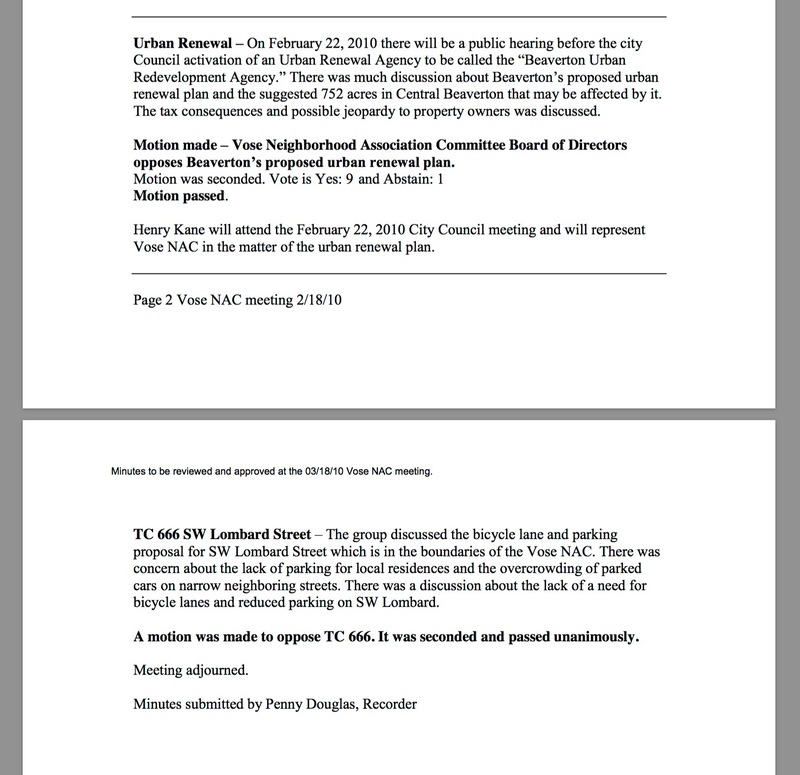 While researching local candidates running in this May’s primary—and I’ve never done more, for any election ever—I learned one had once voted with her Neighborhood Association Committee (NAC) board of 10 people to unanimously oppose bike lanes on a main street in Beaverton. That was eight years ago. It surprised me because I’d read she now supports Safe Routes to School, a program allowing parents to drive cars less. What this shows is, with awareness, people change & evolve over time. I have! Before landing in Portland, I had no idea Americans were replacing their cars with bikes anywhere other than New York City—and that I could, too. And that’s after having grown up for 3+ years in a place with only one shared car in the entire community! Duh, right? Back to that NAC. 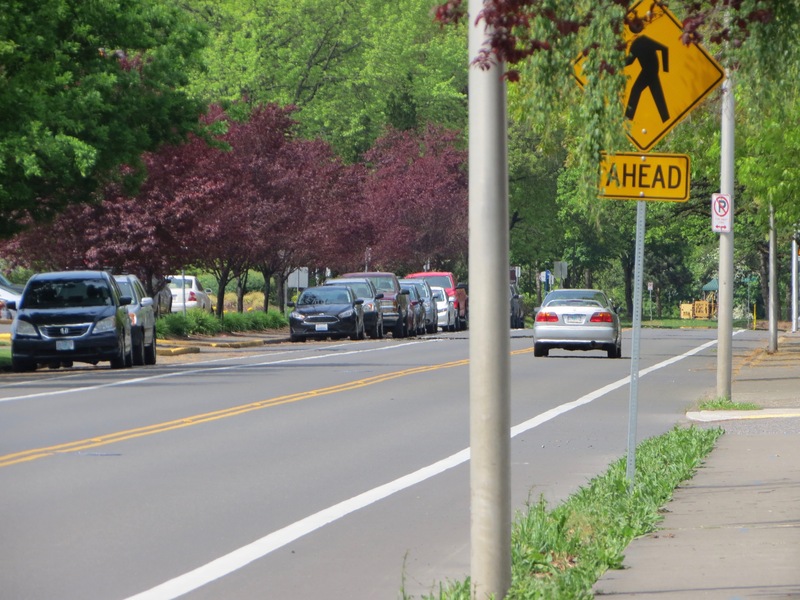 When the city held a hearing that year—2010—residents’ reasons for opposing safer bike travel included that they didn’t have enough parking for all their cars, & the street was too busy for them to easily back cars out of their own driveways. Fewer people driving, & more biking & busing, does seems like an obvious solution for car congestion to more & more of us now. But paradigm shifts involve changing fundamental attitudes, assumptions & beliefs. And many people have been driving cars for a long time, & before they could drive, they were driven in them. Since they were babies, in fact. 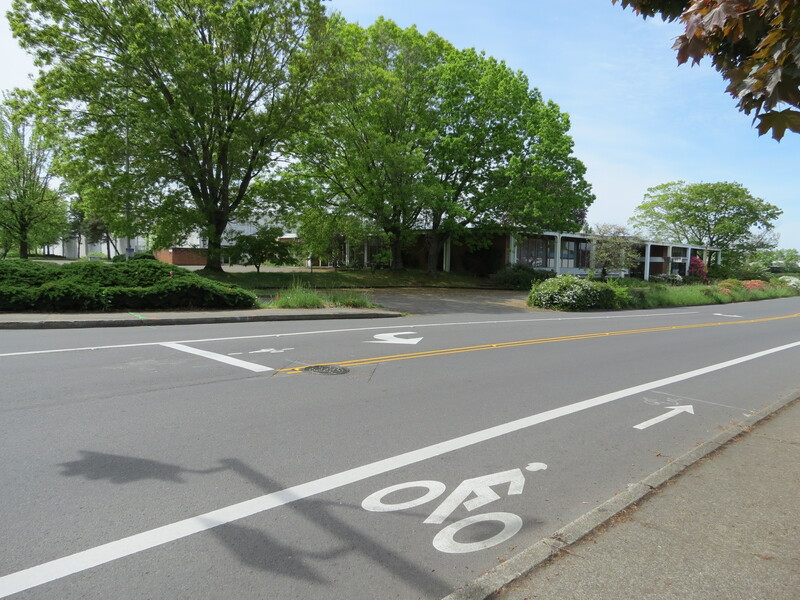 Fortunately, the 2010 Beaverton city council had the vision to approve the bike lanes anyway. Leaders did a great job of explicating and educating about their decision. Councilor San Soucie pointed out (about 1:15:00 in) that property tax dollars collectively pay for our roads. That means even people who don’t own cars pay in. It’s bundled in the cost of rent. Car-free households & renters should have an equal say about road design. 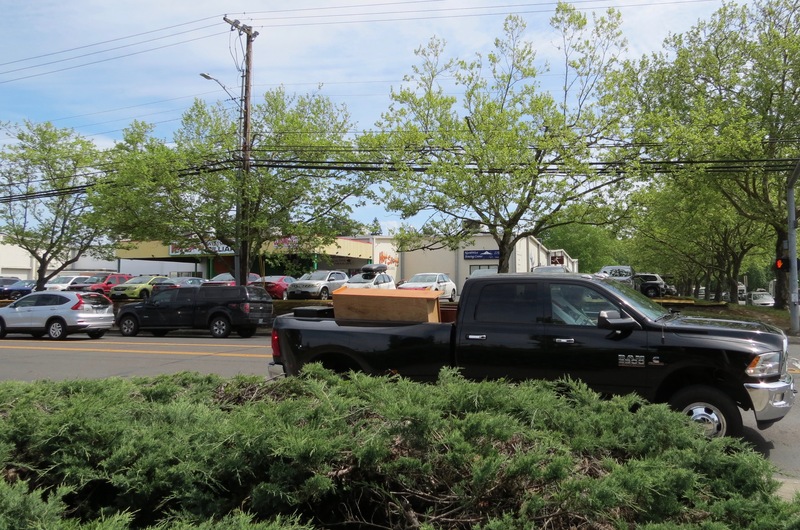 Yet still today, some businesses and homeowner associations are demanding two contradictory things: more public space for driving & storing their cars, but also a solution to the housing crisis that won’t affect them personally. Last month, at a voters’ forum, another local candidate said “I think that we need to have more bike lanes,” in our downtown, like Portland does (at 13:45 in the video). Bicycles are valuable to downtowns. But even candidates who know their value can still see funding for bicycles as a fringe benefit—because that is how we are still treating bike transportation societally. To be fair, we should also ask candidates: What if the city’s choosing between a downtown car parking garage and affordable housing? I’m grateful this candidate was willing to talk about bicycles at all, when many still refuse to. But his position is nuanced, & I see where he’s coming from. The way this May 9th article puts it implies that when this candidate learned how large a population of Beaverton school students are without homes. he decided not to support the city’s Active Transportation Plan. The candidate is quoted as saying that transportation on a bicycle is not more important than families who cannot eat, or have their electricity turned off. Of course it isn’t. Neither is driving to Target—or any transportation in a car. Yet taxes are being allocated for car lane widening and car parking lots—even at transit stations! That won’t put more food on those families’ tables. Freeways won’t help them get to their job if all they have is a bicycle. If someone’s electricity was shut off because their car broke down for good, & there are no sidewalks to get to the once-an-hour bus, and biking is too dangerous, maybe that’s why they couldn’t get to their job in the first place. Vicious set up. That’s one reason I do support Active Transportation & Transit policy—as long as it reaches throughout the city, to all its neighborhoods, rented & owned, to benefit & give options to all residents, rich or poor. If we reduce the need for cars, we can save money & not widen yet another freeway yet again, then again. Let’s give freight & buses the room our autos have been gobbling up on freeways. Of course, there are those neighborhoods so affluent, with monetary wealth so unimagined from an RV on a dead end street, that the homeowners there have no idea what I or the executive director of NW Fencing Center or these candidates are even talking about—at least, not till they decide to drive to the city one day & discover that people are welcome there now; cars, not so much.